VULCAN — Anna L. Milligan, 90, of Vulcan, died Sunday, Aug. 26, 2018, at Maryhill Manor in Niagara, Wis.
She was born May 25, 1928, in Detroit, the daughter of the late Paul and Alma (Sizemore) Tiffany. Anna graduated from Detroit’s East Commerce High School in 1945 and received a bachelor’s degree in education from Michigan State Normal College (now Eastern Michigan University) in 1948. She also attended Capital University in Columbus, Ohio. With relatives in the area, she took a job as kindergarten teacher for Foster City Elementary School in the Upper Peninsula. Anna married the love of her life, James J. Milligan Sr. on June 3, 1950, in Foster City. He preceded her in death on Nov. 1, 2014. Anna worked for the Dickinson County Head Start program for 24 years, and received her master’s degree in elementary education from Northern Michigan University in the 1980’s. She proceeded to teach early childhood education classes at Bay College for many years. Anna was proud to be named Homemaker of the Year at the 1990 Dickinson Co. Fair. Above all, she enjoyed time with her family and grandchildren, as well as knitting, sewing, gardening, canning, baking, playing the piano, adult coloring and solving puzzles. Well-read and intelligent, she conversed on many topics and issues. To her last days, Anna modeled integrity, kindness and love, as a lesson for us all. The family wants to extend a special thank you to the wonderful, loving staff at Maryhill Manor Nursing Home. Anna is survived by her son, Michael (Karen) Milligan of Bath; daughters, Sheryl (Tony) Baciak of Norway, Lynn (Jim) Opolka of Norway and Diana (Todd DeClark) Milligan of Niagara, Wis.; grandchildren, Ian (Nicole Rebusi) Milligan, Tony (Jenn) Baciak, Tom (Meredith) Baciak, Teresa (Whitney Lessor) Baciak, Mindy (Jeff) Herman, Matt (Megan) Opolka, Audra (Kevin) Brush, Alaina (Joe Plourde) Gendron, Ryan Milligan and Tiffany Milligan; step-grandson, John (Erin) Gendron; 15 great-grandchildren; sisters-in-law, Faye Bartoszek of Overland Park, Kan., Phyllis (Marshall) Kesler of Iron Mountain; many nieces and nephews; and close family friend, Patti Bucierka of Kaukauna, Wis.
She was preceded in death by her son James Joseph Milligan Jr; and her only sibling and sister, Shirley Francis of Howell, who passed away only four hours prior to Anna. Visitation will be 10 a.m. to noon Friday, Aug. 31 at St. Mary Church in Norway. The Mass of Christian Burial will follow at noon Friday at the church, with Fr. Timothy Ekaitis officiating. Interment will be at the Norway Township Cemetery. 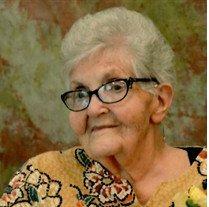 Condolences to the family of Anna may be expressed online at www.ortmanfuneralhome.com.